Internet service provider JT (formally Jersey Telecoms) has outright purchased 10 Trafic and nine Master models to use solely in the ongoing installation of the advanced fibre network for the ‘Gigabit Jersey’ programme. JT pitched vehicles from four manufacturers against each other before opting for the Trafic and Masters – which marks the first Renaults used by the firm. Supplied by Bagot Motors, the Trafics were chosen with a short wheelbase, low roof (SL27) format with the dCi 115 1.6-litre turbodiesel engine, while the Masters were specified with a medium wheelbase, medium roof (MM33) and the dCi 125 2.3-litre turbodiesel engine. Both models are equipped with the Business trim, which includes DAB radio with Bluetooth, ESC (Electronic Stability Control) with HSA (Hill Start Assist) and Grip Xtend – which allows the vehicle to regain traction on loose ground such as sand, mud or snow; electric front windows and remote central locking. As with all Renault LCVs, JT’s vans come with a four-year/100,000-mile warranty and roadside assistance package. 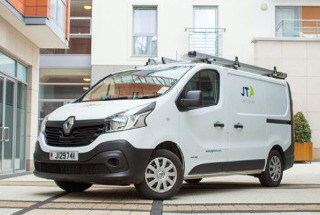 Kevin Hunt, procurement manager at JT, said: “Our vans will only cover a few miles each day but they will be in constant use and are absolutely critical to the success of the gigabit project.